For thousands of teens, the ideal summer camp has nothing to do with roasting s'mores over a fire. It's about devoting an intensive week or two — or maybe the entire summer — on a college campus, immersed in the world of policy debate. Researching and practicing arguments in a top-notch university library. Getting a chance to try out college life while bonding with fellow debaters. 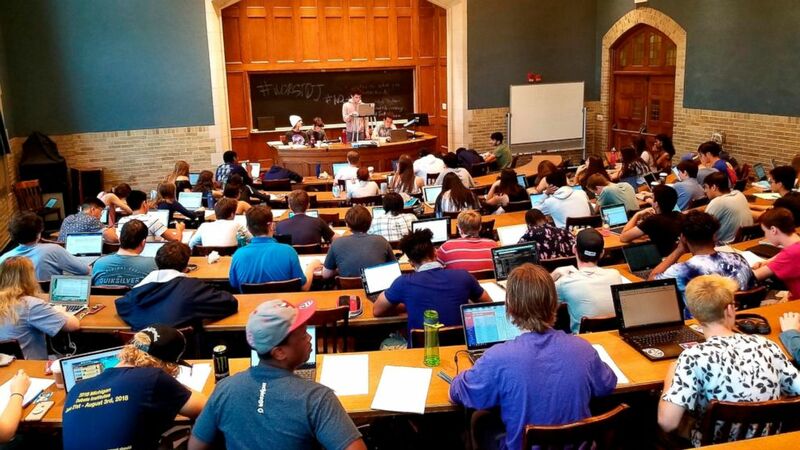 "It's a great chance to hone critical thinking, public speaking and research skills, and get a real feel for college life," says Aaron Kall, who runs the University of Michigan debate team and the university's policy debate summer camp. For university admissions officers, it's a chance to meet motivated kids and show them what the university has to offer. Often, students select camps at universities they are considering attending after high school. There are around two dozen policy debate summer camps across the country, all of which focus on the same policy topic, agreed on each year by the National Federation of State High School Associations. So when campers return to their high schools in the fall, they are ahead of the curve when tournament season starts since they will have already devoted extensive time and practice to the subject on which all the debate tournaments that year will be focused. This year, for example, the topic is whether the federal government should decrease restrictions on immigration. This summer and next school year, the focus will be whether the federal government should reduce arms sales. "Debaters might do research on whether more visas should be offered to professionals in STEM fields, for example, or the pros and cons of any of a number of aspects and perspectives of the main topic," explains Mikaela Malsin, head of debate at Georgetown University, who oversees that university's policy debate summer camp. Other universities with policy debate summer camps include the University of California Berkeley, Northwestern University, Dartmouth College, Michigan State University, Emory University, George Mason University and Baylor University. Some invite professionals involved in the selected debate topic to offer expert views. Contrary to popular belief, the camps attract a wide range of students, "not just nerds and kids who want to go to law school," says Malsin. "The kids come from all kinds of backgrounds. A lot of them find debate to be a very empowering form of expression, especially kids from lower-income backgrounds who are very smart and need an avenue to expand their intellectual curiosity," she says. Debate camp also attracts kids in drama who are seeking a more intellectually rigorous aspect of public speaking, and kids who just want to be immersed in a setting focused on ideas. "The community tends to be really accepting and open to all sorts of different ideas and perspectives," Malsin says. Another misperception is that debates resemble a courtroom setting, or a back and forth like one might see during a political campaign. "Some people imagine that debates are formal, like a presidential debate. It's a lot more casual than that, with people talking very quickly and practicing reading their arguments from laptops," Malsin says. Each policy debate summer camp accepts between 150 and several hundred debaters each summer, mostly — but not exclusively — high school students. They tend to fill up by early April. The camps are not cheap, averaging around $1,000 per week including room and board, according to Malsin, who adds that scholarships and financial aid based on merit or need are usually available. "The camps are not necessarily competitive in terms of admissions, but the students who enroll tend to be ambitious and intellectually curious. Students don't accidentally show up at these sorts of camps," Malsin says. "And anyone unsure about how much they like debating might want to hold off, or start out with one of the shorter camps. If you're on the fence to start with, it might turn out to be a little overwhelming." That said, debate camp organizers say campers get so passionate about debating and researching that it's often hard to get them to wind down. "Campers do have recreational time, usually in the evenings or on weekends, when we take them to see the sights in the Washington, D.C., area," says Malsin. "We refer to it as 'mandatory fun time.'" Kall also says students tend to be so passionate about debate practice that it can be hard to get them to turn off the lights at the required hour. "The friends you make at policy debate summer camp often end up being friends for life. I'm still in touch with some of the kids I met in debate summer camp when I was in high school," he says.